Happy Fall everyone! 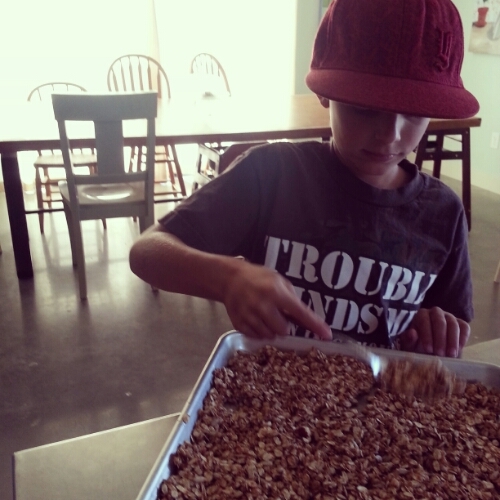 This weekend we made a few granola treats to celebrate the seasonal change of guard. 1. Mix honey, coconut oil, salt, spice,and vanilla in a large bowl. 2. 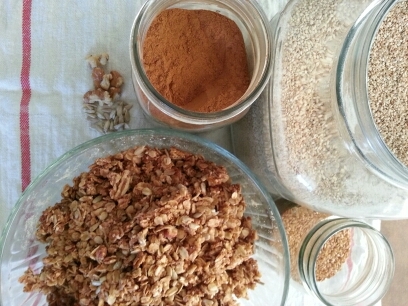 In a separate bowl, combine remaining ingredients. Add to honey mixture and mix thoroughly. 3. Spread over greased cookie sheet. Cook at 325 degrees for 16-18 minutes. Stir a couple times while baking. 4. Let cool until dry and crunchy (this did not take long for us) :), and store in an airtight container. 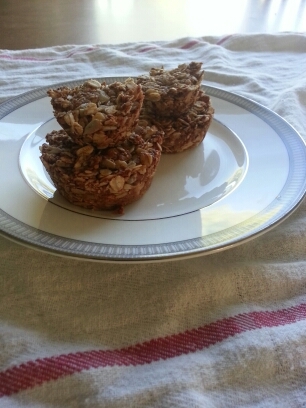 For the dancer’s pumpkin pecan pie spice granola discs use muffin pans (we used mini and regular sized pans)…totally her idea…she’s our cooking genius.